Create trendy gift packaging with our Exclusive kathy ireland® by Firefly Store Solutions Deco Dreams Gift Bags. 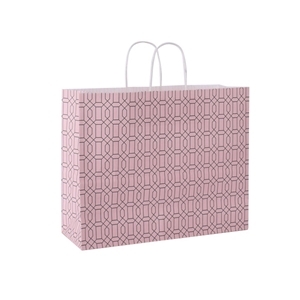 These designer paper shopping bags are made from 40% Post-Consumer and 11% Post-Industrial Fibers, made in USA, ECO friendly, and features a modern deco design. Coordinate the deco dreams gift bag with matching tissue paper and gift wrap (sold separately) to create a truly unforgettable presentation. • 16" x 6" x 13"